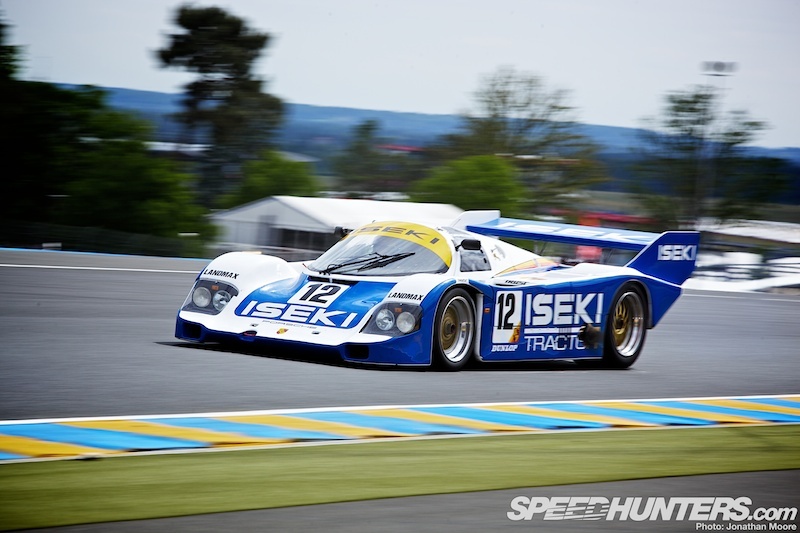 This year the Group C sportscar rules are celebrating 30 years since their inception, and the organisers of the Le Mans 24 Hours invited the Group C/GTP historic series to be the hors d’oeuvre for the 24 Hours this year. 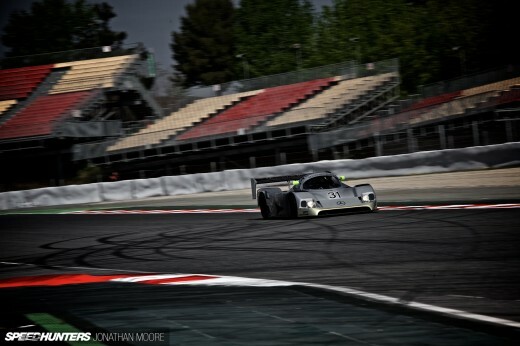 This being the natural home of these big sports prototypes, drivers jumped at the chance of competing and a bumper grid of 30 cars took part in what would be the third round of their six round series. 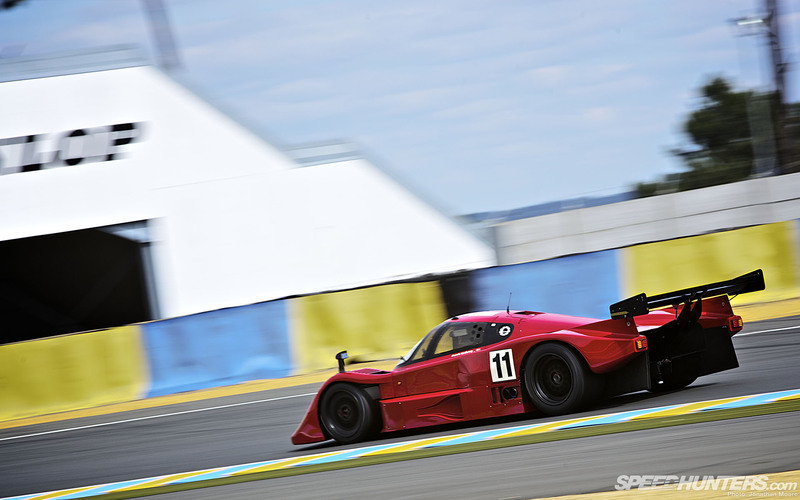 The C11 is a work of art. 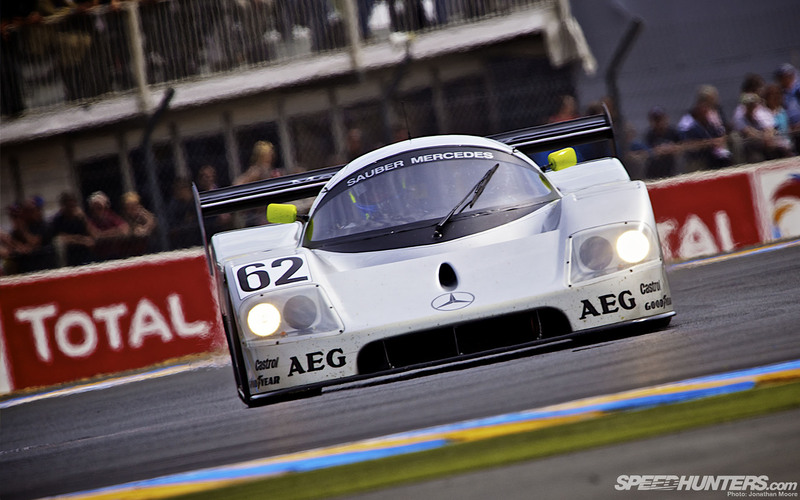 It uses the same Mercedes-Benz M119 5.0-litre bi-turbocharged V8 as the C9, but is wrapped in longer, more svelte bodywork – though of course it still sports the simple perfection of that flat silver livery. 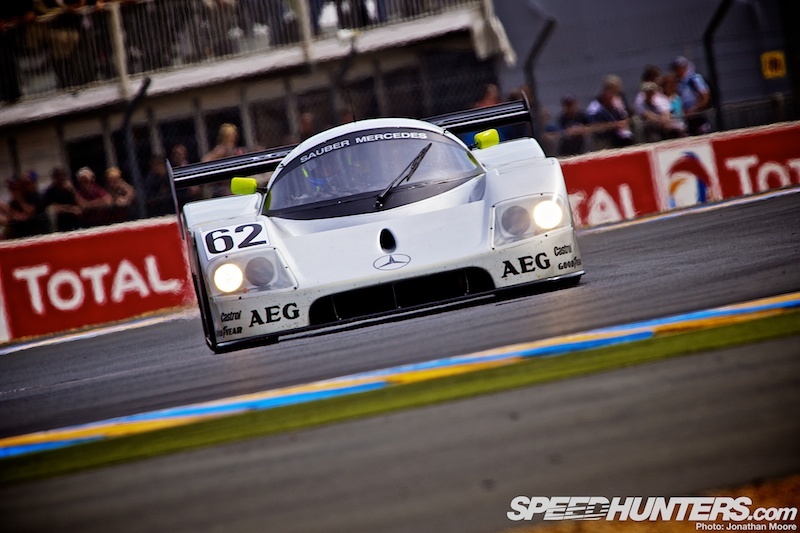 The 1990 C11 was the first Sauber-built Group C sportscar that Mercedes put their name to: they won all but two races that year and swept the teams’ championship. 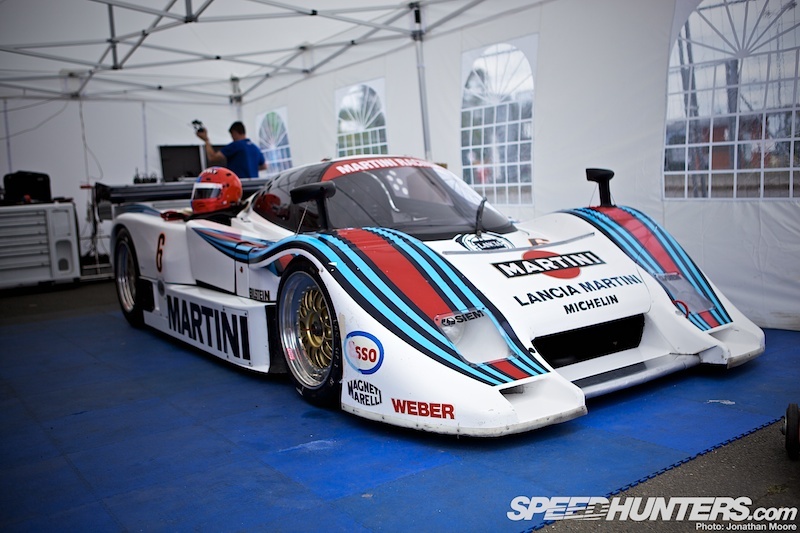 A single Lancia LC2 ran at Donington – here we had a trio of the beautiful Ferrari-powered C1 cars on show. 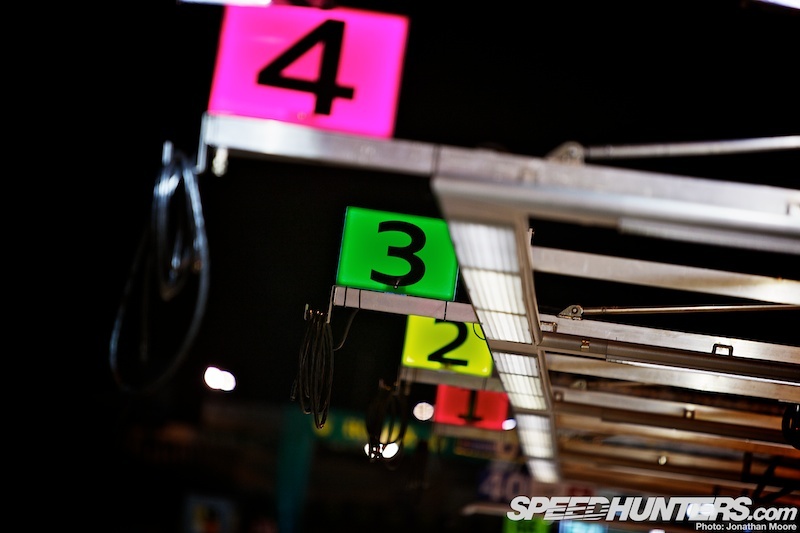 The #5 car of Roger Wills was the fastest Lancia, posting the third fastest time: 3:55.216s. 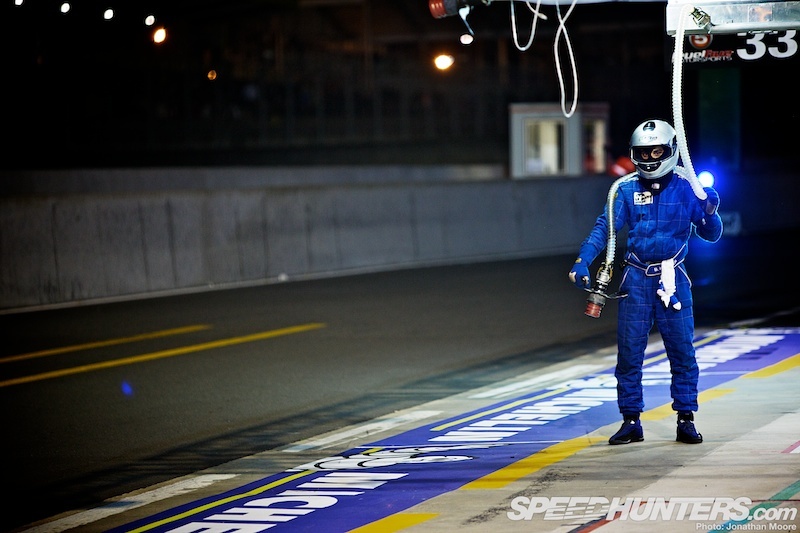 Roger was also driving the #66 JMW Ferrari 458 Italia in GTE-Pro in the main 24 Hours – quite a contrast. 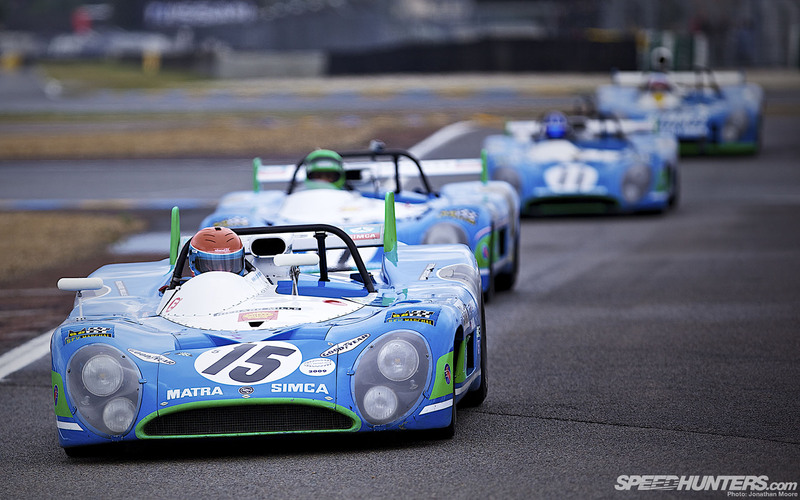 1984’s sister car to the #5 was also brought out to play, with the two Lancias circulating in formation at the beginning of Qualifying. 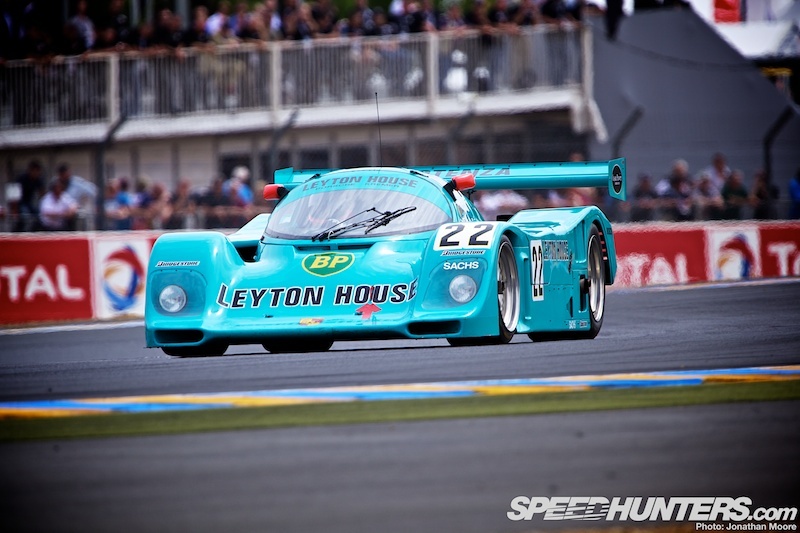 The LC2s sounded amazing: their 3.0-litre Ferrari V8s (based on the unit from the 308 QV) mounted twin KKK turbochargers and produced around 850hp. 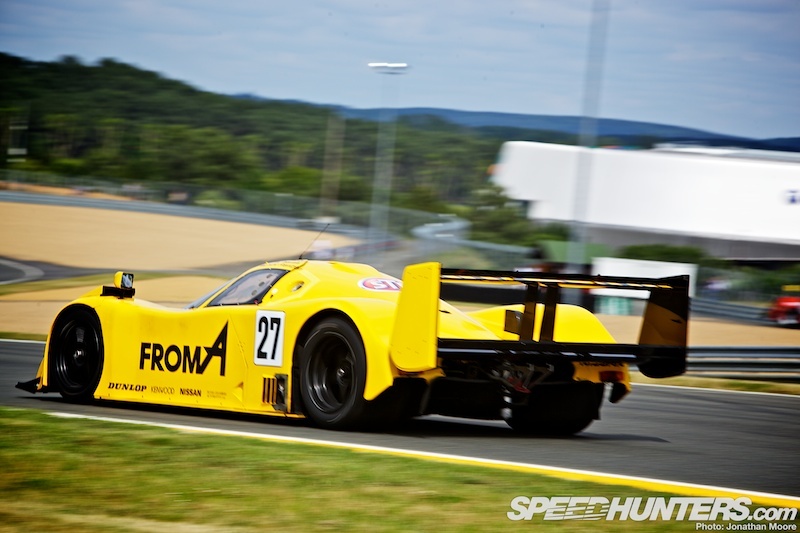 The third car at Le Mans was one of the last chassis built by Dallara in 1989, with privateer teams continuing to campaign the car (with a phenomenal lack of success it has to be said) after the factory team pulled out in 1986. A very welcome sight was the Nissan R90CK that was heavily damaged at the Donington Historic Festival when the car snapped under acceleration at the rolling start and speared into the barrier. 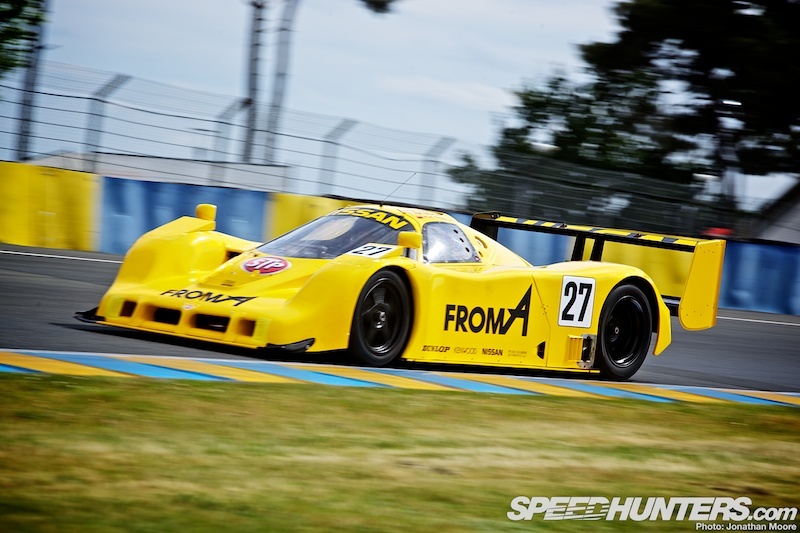 Steve Tandy’s team had done a great job to put the car back together again: it’s one of the original Le Mans chassis from 1990 that was then shipped over to Japan for the All Japan Sports Prototype Championship and converted to sprint specification. The team then had another nightmare in qualifying due to a small electrical fire right at the start, but it was again repaired and back out for a shakedown lap at the end of the session. Steve wasn’t that thrilled about having posted an official qualifying time of 55:21.827s! 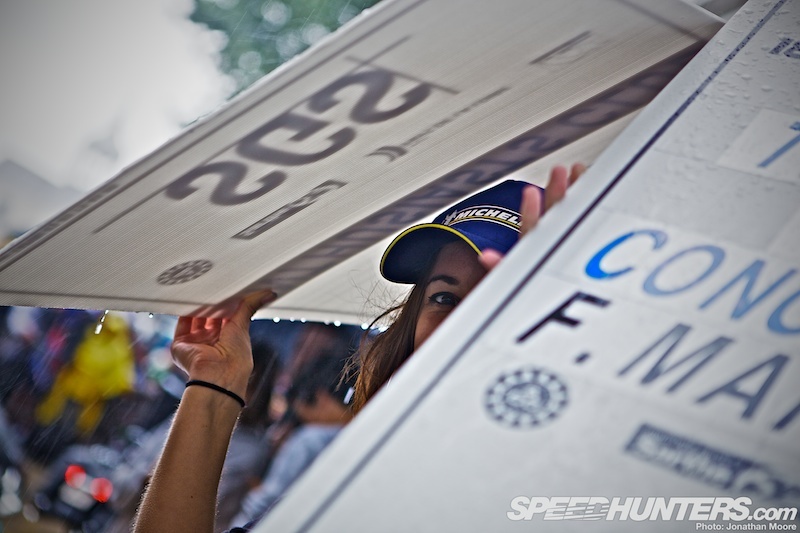 The race made the overcast conditions of qualifying seen her seem idyllic – the rain absolutely lashed down, eliminating two C2 cars on the first lap and causing the majority of the race to run at reduced pace behind the safety car. Luckily we had a full hour in Qualifying to appreciate the 21 C1s and 9 C2s in better conditions (and even more time to check out the additional entries back in the paddock that weren’t able to go out). 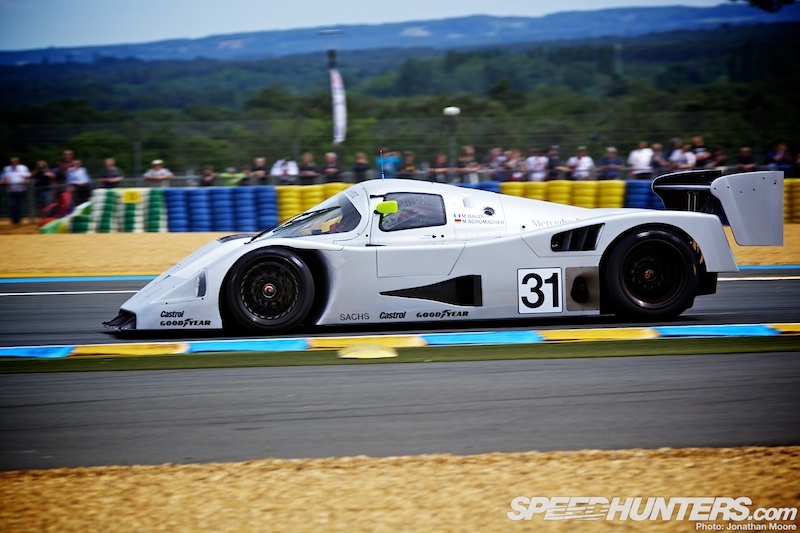 Typically we’ve seen phalanxes of Jaguars at previous Group C revival races at Le Mans, but this time just a single C2 XJR5 was driven out, with the Budweiser XJR16 stuck under its awning. 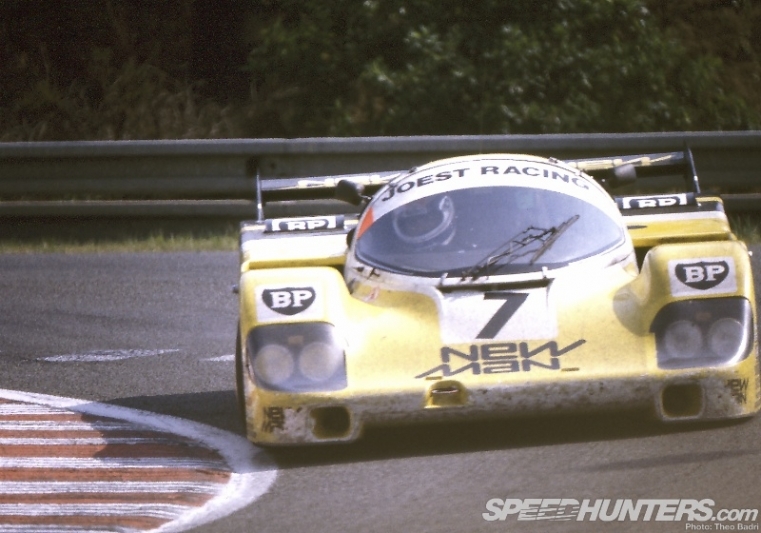 But we had seven Porsche 962s and a 956 to enjoy, with this black 962 from 1990 a menacing presence on the circuit. The 1984 ISEKI 956 was joined by the short-tail Leyton House and Alpha 962s seen above, plus further 962s: 1985 Almeras, 1986 Blaupunkt, 1990 Primagaz and a 1990 Jägermeister short-tail. 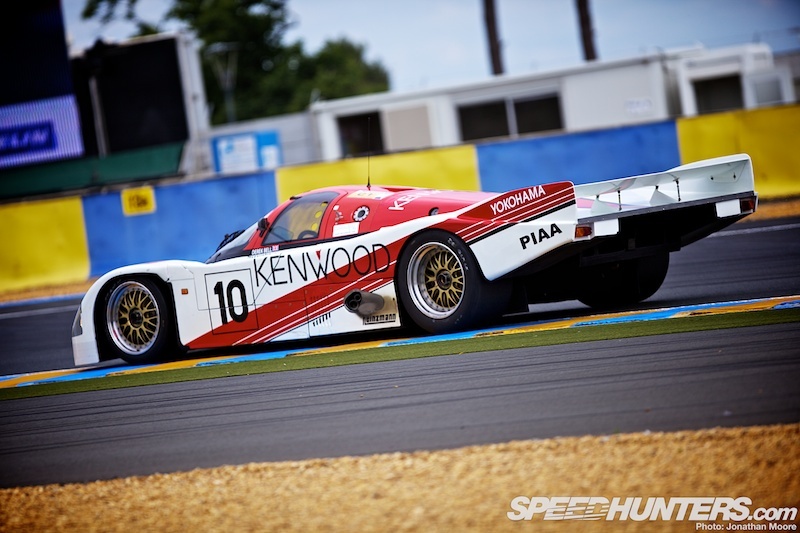 The driver of the #10 Kenwood Porsche 962 had even more pedigree than the car, as it was piloted by five-time Le Mans winner Derek Bell. 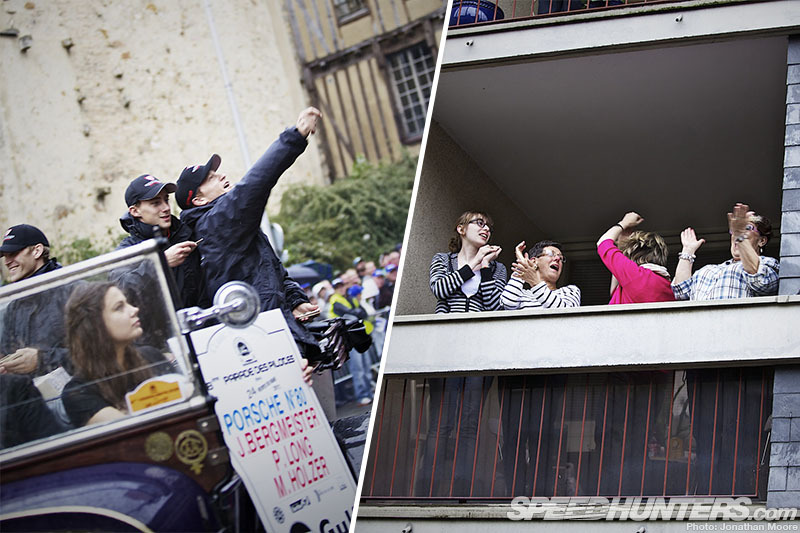 He even provided a live commentary from the cockpit on the Radio Le Mans feed whilst driving – and certainly made his feelings clear about the difficulties of driving this long-tail, low-downforce variant of the car at Le Mans, despite obviously enjoying the experience. 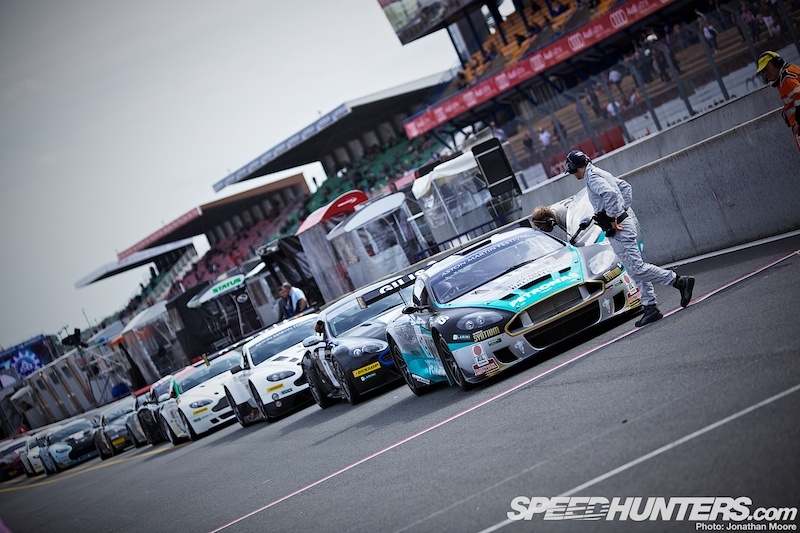 The second supporting act to the 24 Hours was the Aston Martin Festival: a race open to GT-class Astons from the modern era. 20-odd GT4s were joined by a pair of GT1s and GT2s, five GT3 and the V12 Zagato: the interesting mix of cars was matched by the drivers, as the line-up included Prodrive boss Dave Richards and comedian Rowan Atkinson. 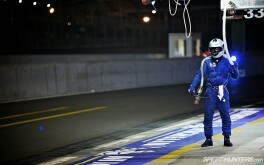 French racing hero Henri Pescarolo had a pretty torrid weekend in the 24 Hours, but his popularity never wanes. Despite occasionally being a thorn in the side of the ACO, he turns up every year (business disasters aside) to be greeted by the cheers of the crowd. 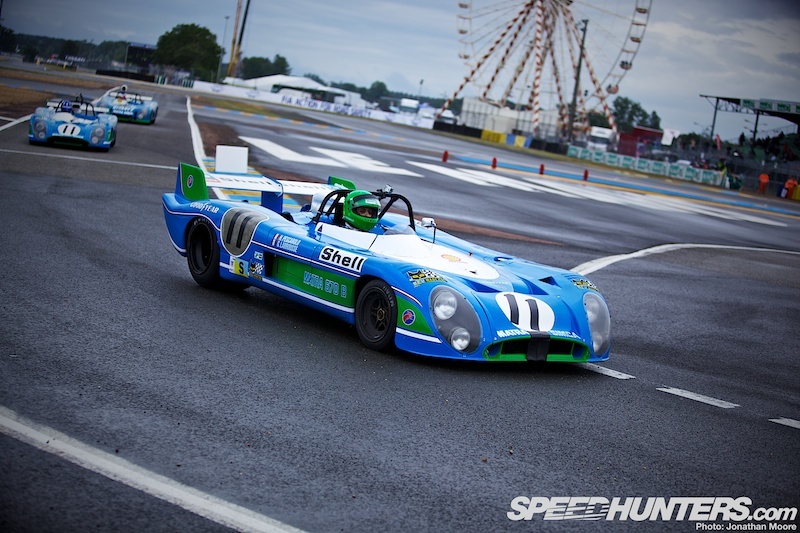 This year he was even granted the honour of being part of a demonstration of a quartet of wailing V12 Matras out on the track ahead of the start of the race. 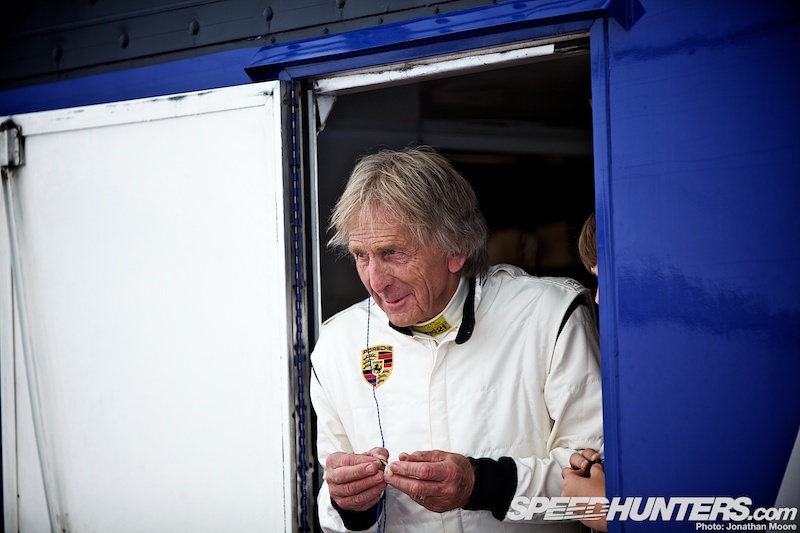 Four decades ago he dominated Le Mans in these cars, winning the 24 Hours three times on the trot from 1972 to ’74. 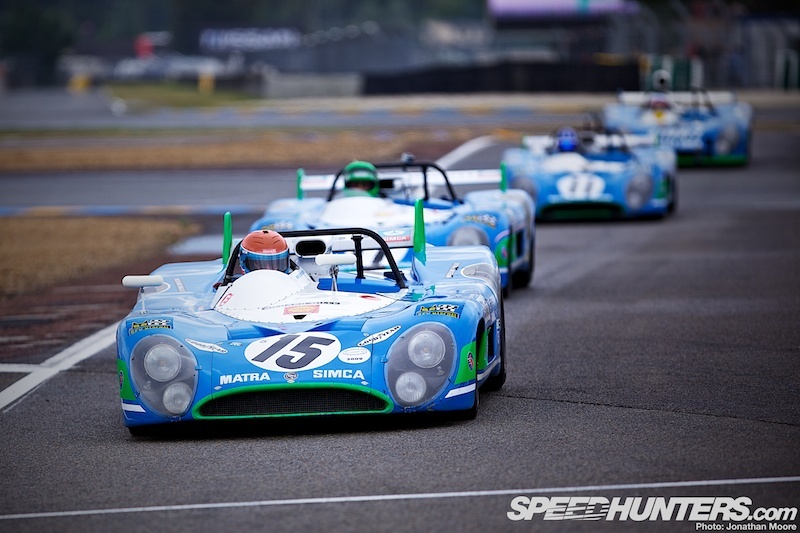 The winning Matra-Simca MS670 that won in 1972 was joined by a pair of MS670Bs from ’73 and the winning MS670B from ’74; the drivers were Henri, Gerrard Larrousse (Henri’s co-driver in ’73 and ’74), Josh Hill (the grandson of joint ’72 winner Graham) and Jean-Pierre Jabouille (who has been on the Le Mans podium three times). 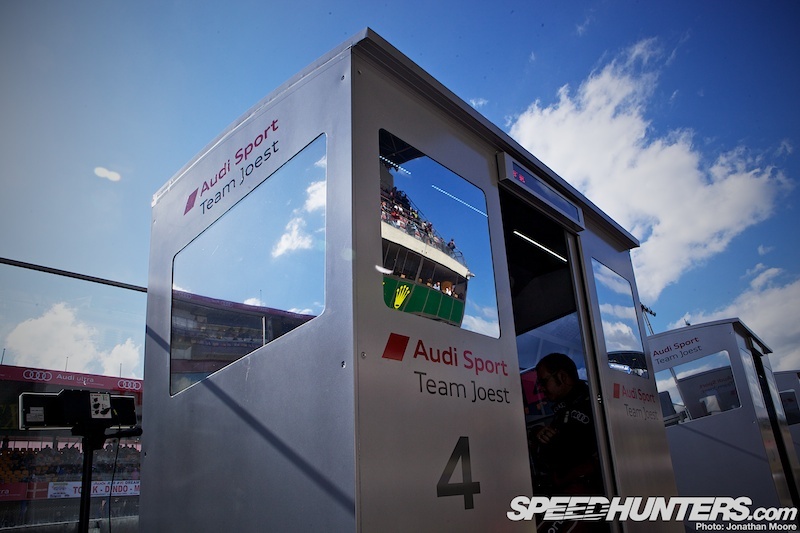 There’s an enormous amount of work that goes on behind the scenes at Le Mans, with thousands of people involved in keeping the event running. 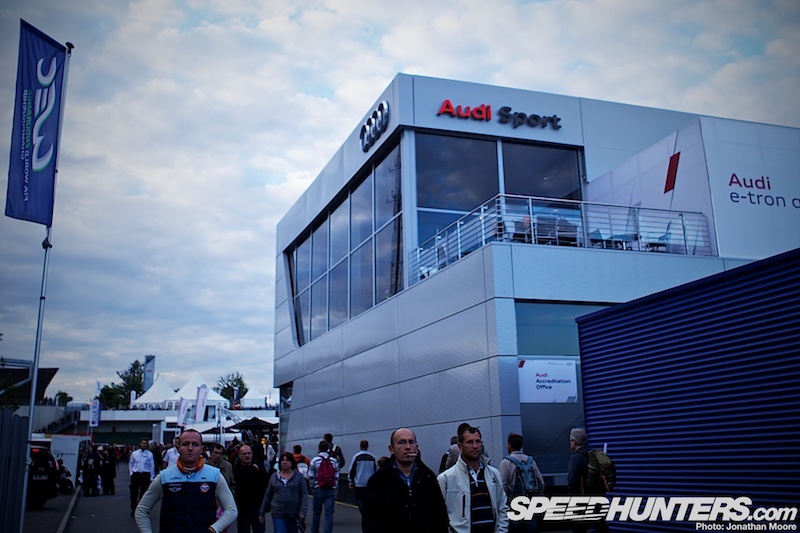 The sheer size of the corporate hospitality at Le Mans is breath-taking. 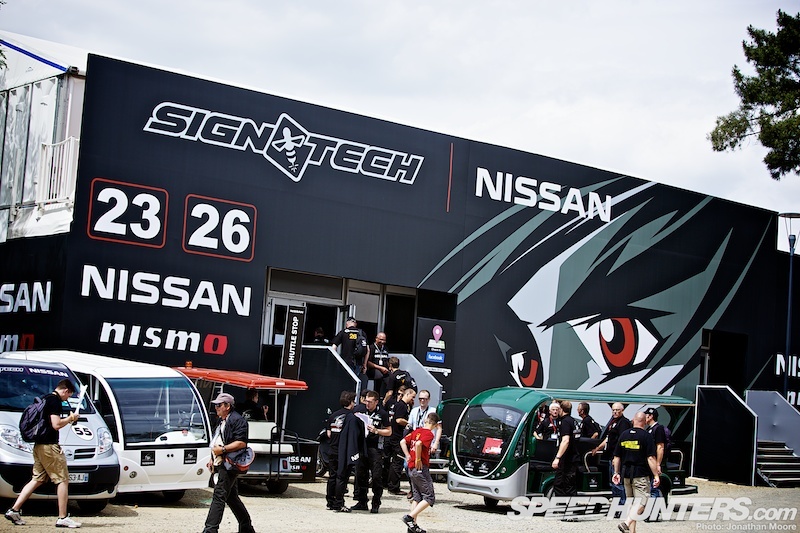 Nissan have engaged Audi in an escalating battle of who can have the most imposing structures, though Audi were up to two double-height floors in their main unit in the paddock. 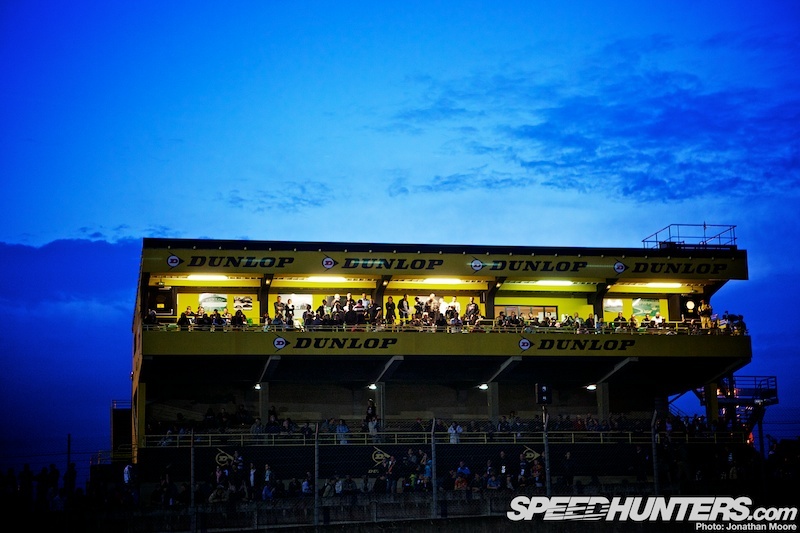 A further pair of two-story buildings had been constructed on the inside of Dunlop and the run to the Ford Chicane. Nissan countered with its own huge building at Ford and the inside of the first corner, plus an aircraft hangar-sized building further out which contained hundreds of temporary bedrooms. 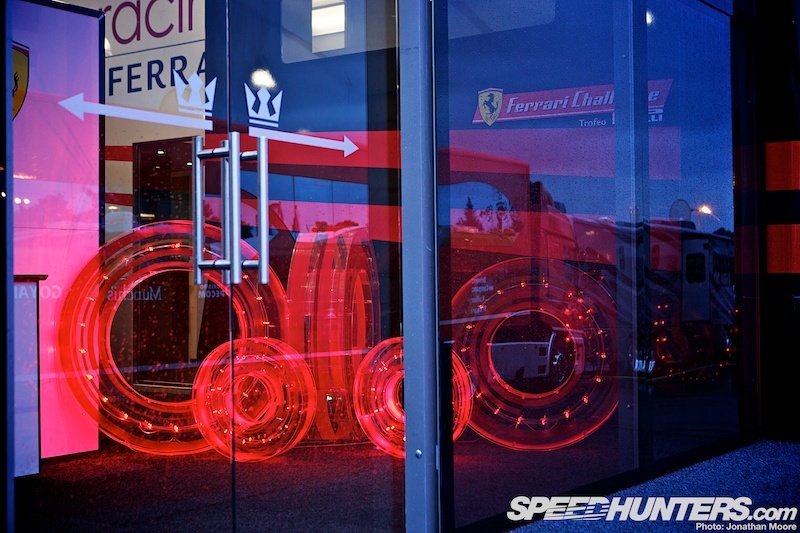 Ferrari teams AF Corse and Luxury Racing had their own aisle in the paddock to themselves, with the latter having a tail-light themed art installation at the entrance. …with all four sitting on carpet. 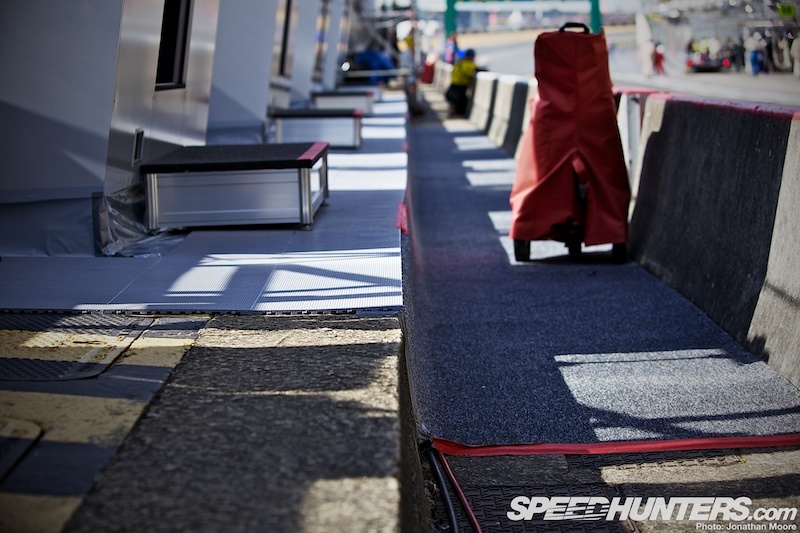 In the open air of the pit-lane. 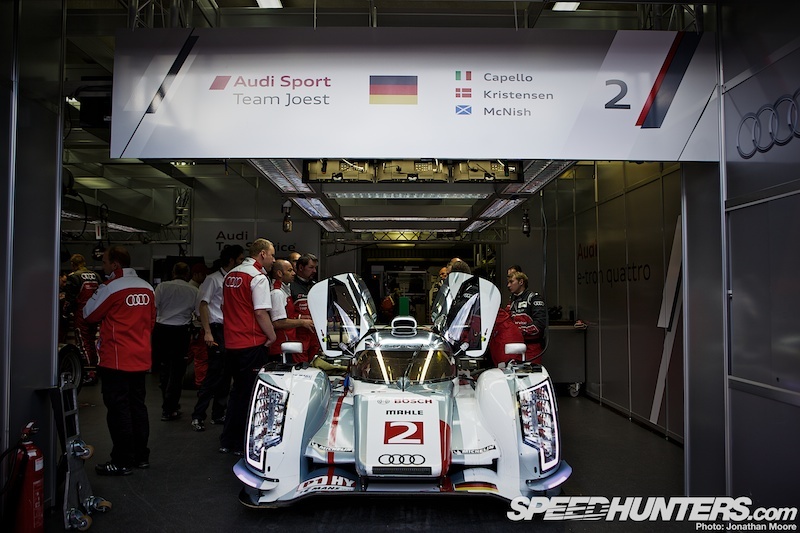 Teams make the best of their temporary homes: multiple-car teams always fair better due to the increased space they can create from conjoined garages. 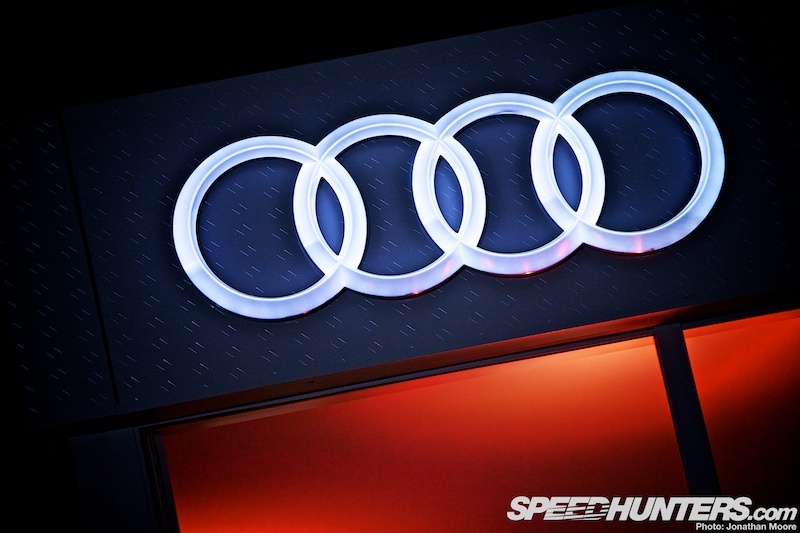 The inside of the pair of Audi garages were completely taken over with a custom-built interior slotted into place, showing none of the base concrete below. 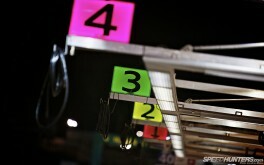 Even their gantries were distinctive with their candy-coloured number panels. 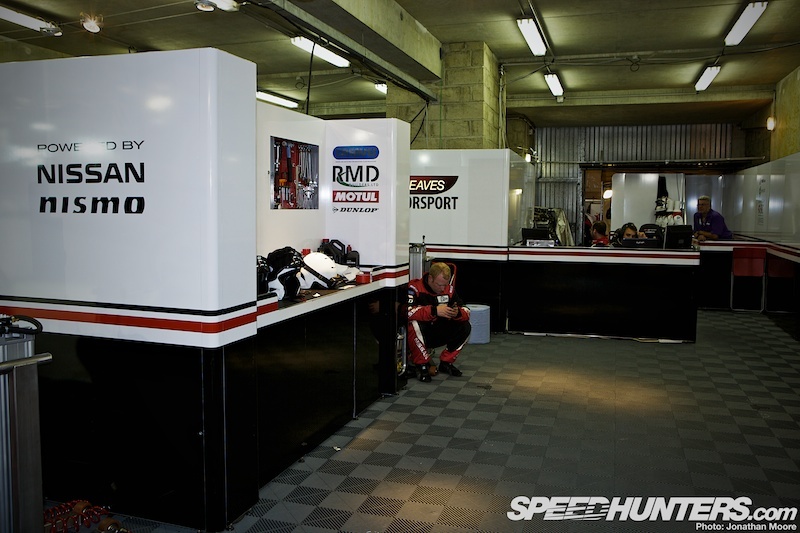 A number of the larger teams decked out their garages with customised dividers and branded working areas, creating a virtual home from home and a more familiar working environment. 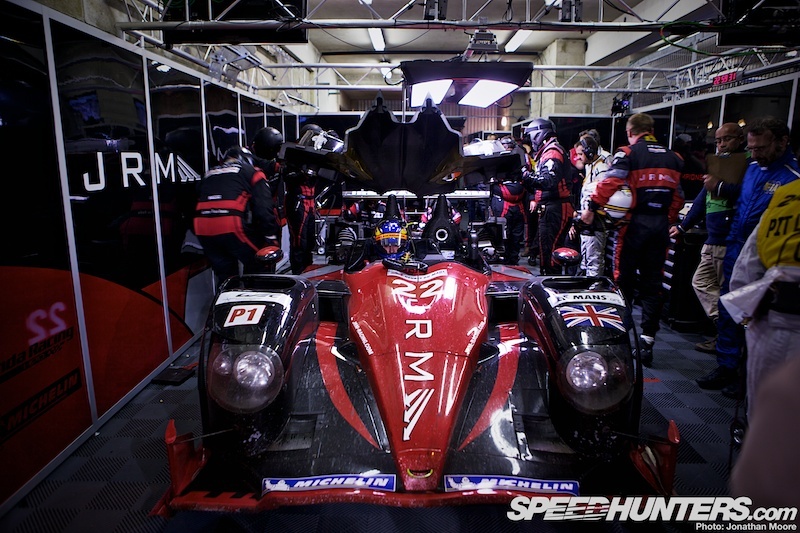 In comparison, single car teams like JRM had to suffer incredibly cramped conditions with barely any space around the perimeter of the car for the mechanics to work. 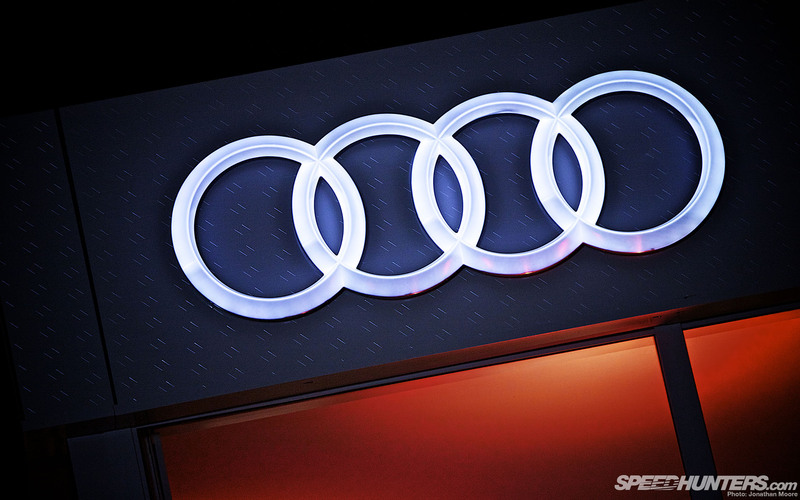 The teams employed various different solutions for signalling their cars, from the electronically-operated swing-out LED panels of Audi to these sliding units at Luxury Racing – and then good old fashioned hand-held boards at many privateer teams. 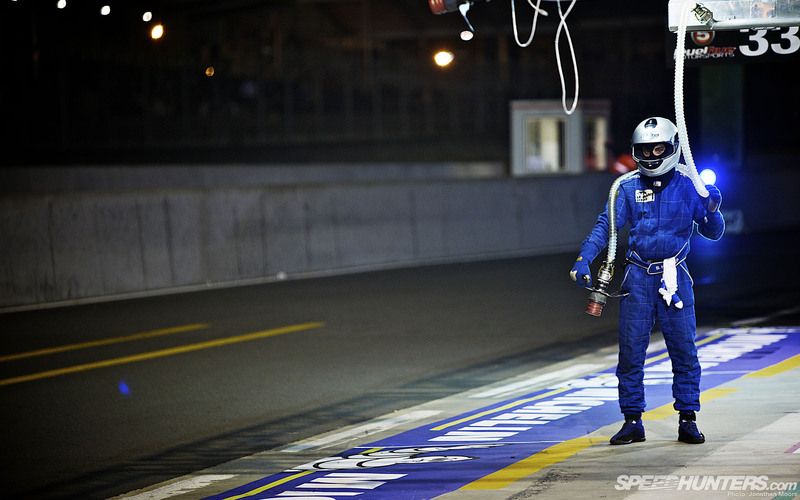 Mechanics at Le Mans never have time to appreciate all the luxury that the guest are enjoying. There’s always a job to do. As if things weren’t difficult enough, even in what they consider their own private working environment there are people on their territory: officials picking them up on every small detail and the media just getting in the way. 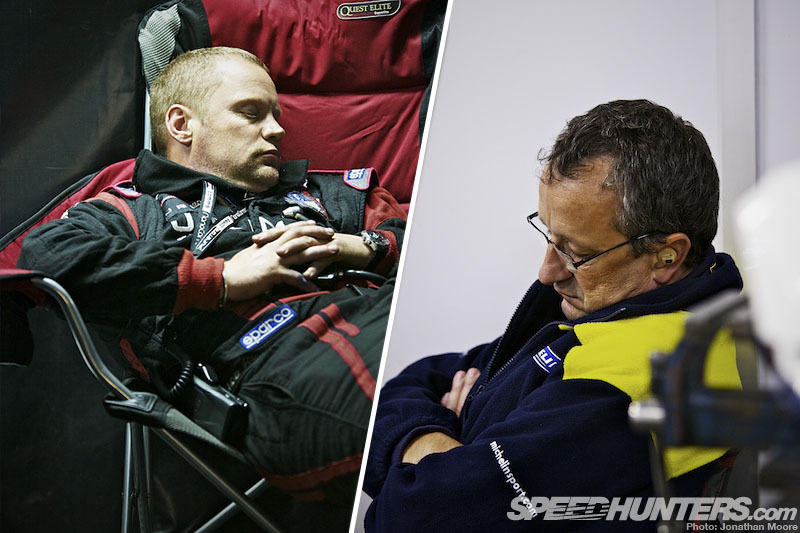 It’s a hard week for the mechanics. 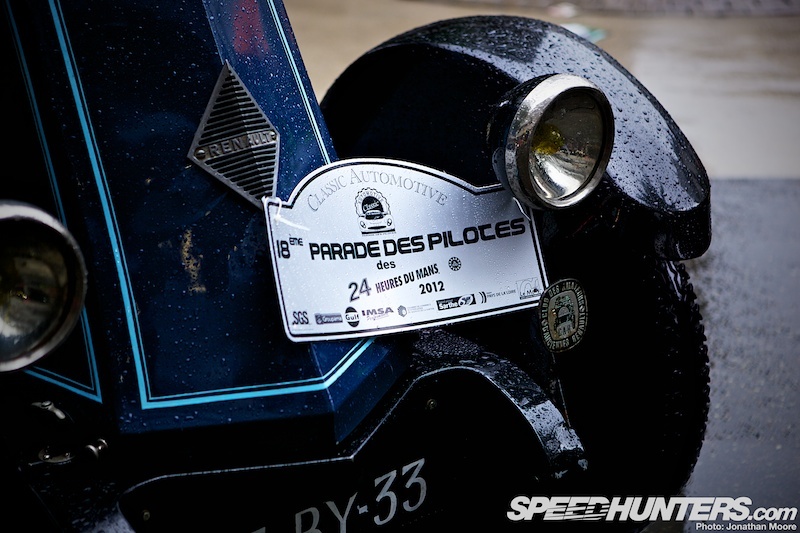 On Friday evening the teams get a little peace and quiet as they pack off their drivers to the centre of Le Mans town for the Parade Des Pilotes, where all the crews are loaded up on classic jalopies for a jaunt around the packed streets. 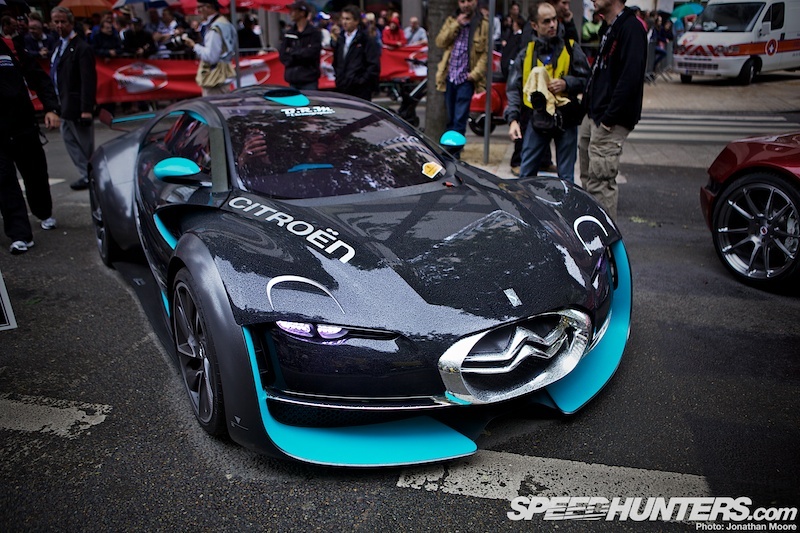 The rain had mostly held off during the week, despite the threats of the forecasts – but it turned out that to have been saving it all up for the parade… Almost as soon as the supercars and electric prototypes had started their runs the rain came down, and hard. 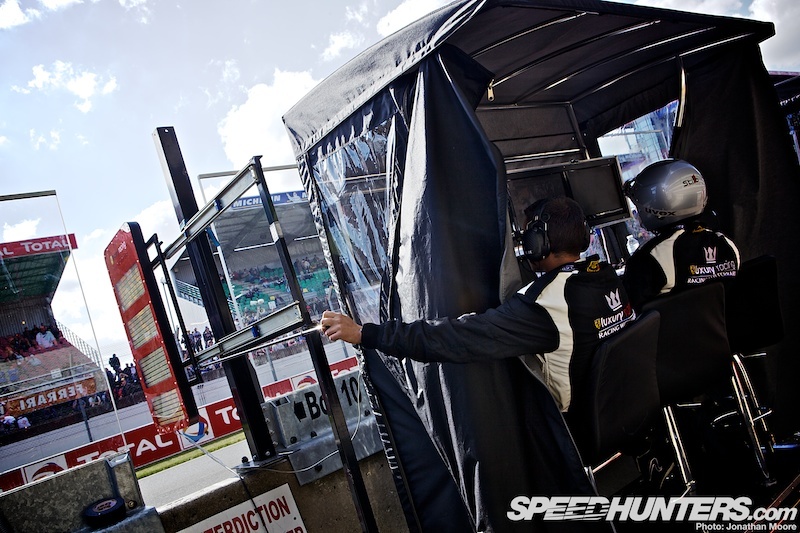 Whilst some took cover, the majority of drivers shrugged off the conditions – after all, the fans were still lining the barriers three deep around the length of the route – and did their best to keep everyone entertained. Flyers were handed out to the nearest people and thrown to the furthest, starting a competition to see who could reach the highest floors of surrounding blocks of flats. Flying Lizard’s bar-mat flyers seemed one of the better optimised and most plentiful long-distance projectiles, and as other teams ran out of their own flyers the Lizard’s merchandise was being thrown out by drivers of all the other teams as well! 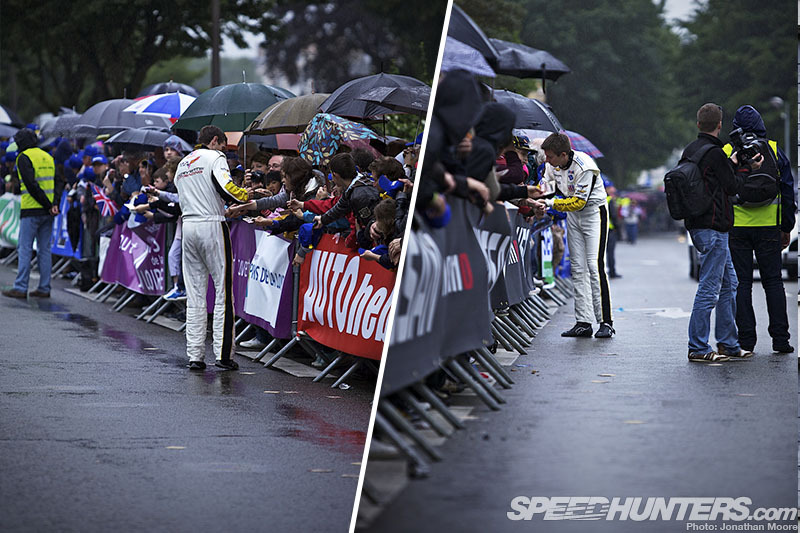 As ever, by halfway round the course many drivers were bored of passively sitting in their cars being pelted with rain, so took to the streets to sign autographs and hand out yet more merch. 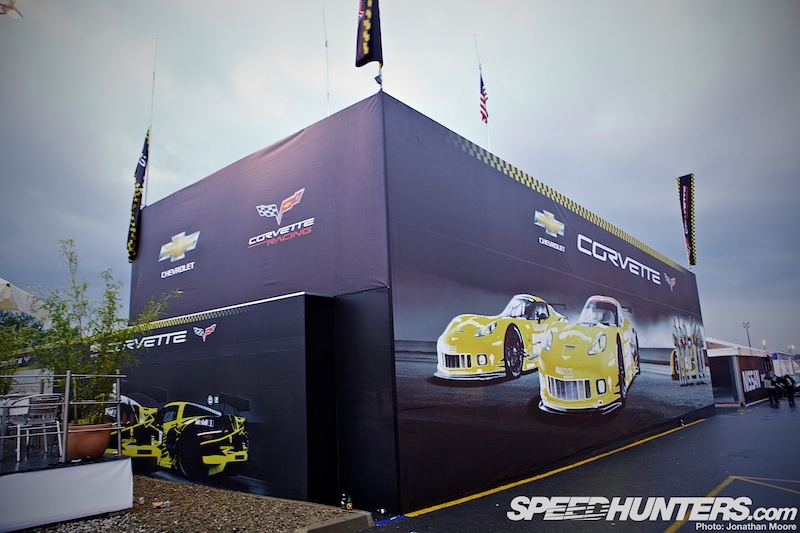 Corvette were as popular as ever; Tommy Milner and Oliver Gavin fell a hundred yards behind their car (with Richard Westbrook still crouched inside) as they signed autograph after autograph for the fans. It’s an unmissable event. 30 years of Group C, 80 Le Mans 24 Hours… In 2013, Le Mans will celebrate yet another anniversary. This year was the 80th running of the race, but due to ‘inconveniences’ (the small matter of a World War) the race is actually 89 years old – so next year’s edition will celebrate the 90th birthday of the Le Mans 24 Hours. 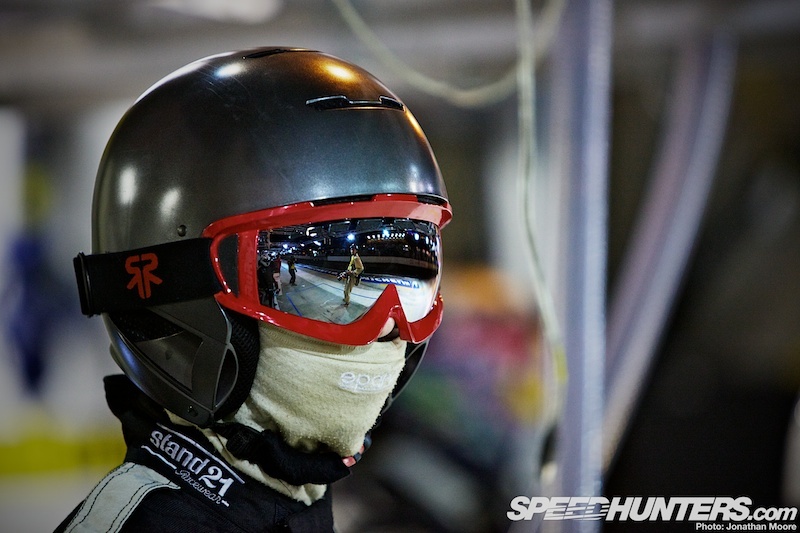 There are 240,000 fans, 168 drivers and one Speedhunter who can’t wait. 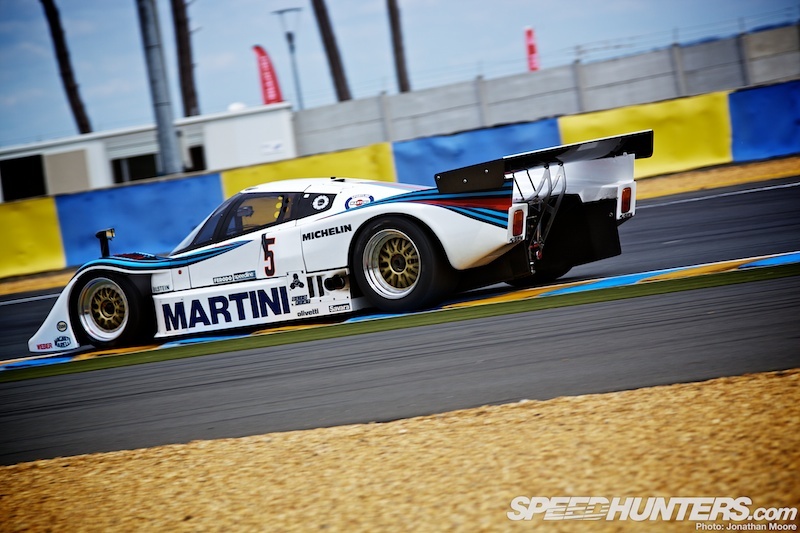 This is awesome, absolutely love the old school Group C cars.. As usual great content guys!!!! Too bad the Mazda 787B wasn't there to complete the line-up. great coverage of behind the scene stuff. 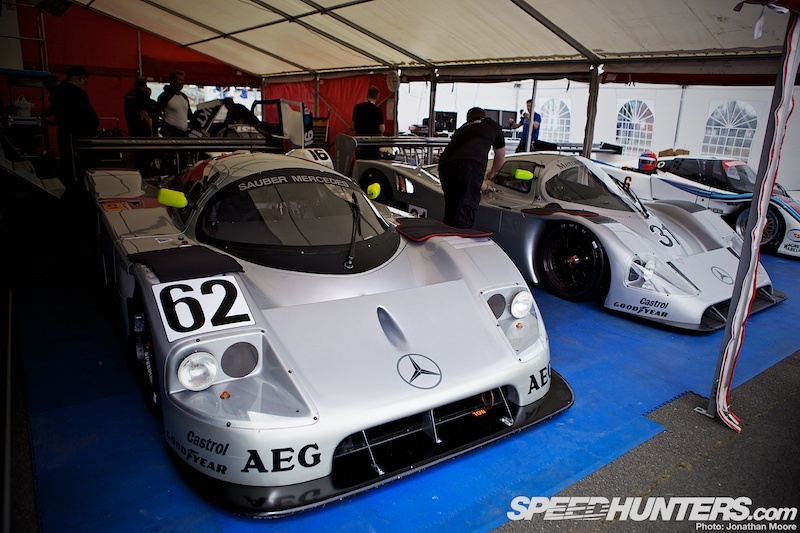 seeing all those old racing cars is just mind blowing. i mean, it was before i was born but i know it. how amazing is that. 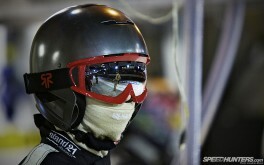 @Howard_C Just asking myself the same thing. 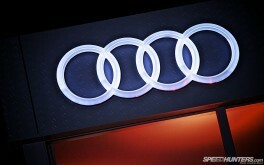 @KietaPhillips Here's one of "The Legend" for you then ...... enjoy!